The layout is the container that has up to five regions: north, south, east, west and center. The center region panel is required but edge region panel is optional. Every edge region panel can be resized by dragging its border, they also can be collapsed by clicking on its collapsing trigger. The layout can be nested, thus users can build what complex layout he wants. 1. Create Layout via markup. Add 'easyui-layout' class to <div/> markup. 2. Create layout on whole page. Notice that the west panel of inner layout is collapsed. The layout is created based on panel. Each region panel provides built-in support for asynchronously loading content from URLs. Using the async loading technology, users can make their layout page display more faster. onCollapse region Fires when collapse a region panel. Available since version 1.4.4.
onExpand region Fires when expand a region panel. Available since version 1.4.4.
onAdd region Fires when add a new region panel. Available since version 1.4.4.
onRemove region Fires when remove a region panel. Available since version 1.4.4.
region string Defines the layout panel position, the value is one of following: north, south, east, west, center. expandMode string The expanding mode when click on the collapsed panel. Possible values are 'float','dock' and null. float: the region panel will expand and float on the top. dock: the region panel will expand and dock on the layout. 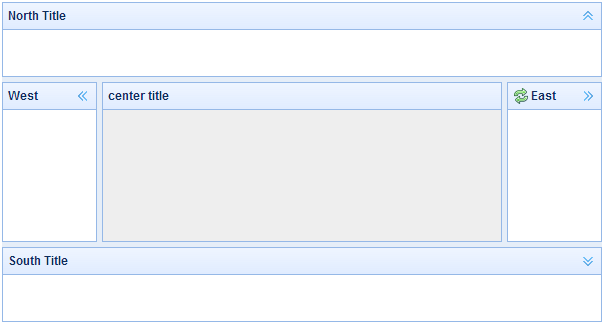 2) a function that returns the title content. panel region Return the specified panel, the 'region' parameter possible values:'north','south','east','west','center'. collapse region Collapse the specified panel, the 'region' parameter possible values:'north','south','east','west'. expand region Expand the specified panel, the 'region' parameter possible values:'north','south','east','west'. add options Add a specified panel, the options parameter is a config object, see tab panel properties for more details. remove region Remove the specified panel, the 'region' parameter possible values:'north','south','east','west'. split region Split the region panel. Available since version 1.4.2.
unsplit region Unsplit the region panel. Available since version 1.4.2.